New Gold Wings don't come around very often so this all-new 2018 example (the last was in 2001) is big, big news. It's been worth the wait, too: more power, lighter weight, a DCT option and more equipment than most can imagine. This all-new 'Wing, while still an 1833cc flat-six is a quantum leap up from the old. Spec, refinement, ability and comfort are all hugely impressive. The only downside is BM's K1600 six is phenomenal, too - and significantly cheaper. 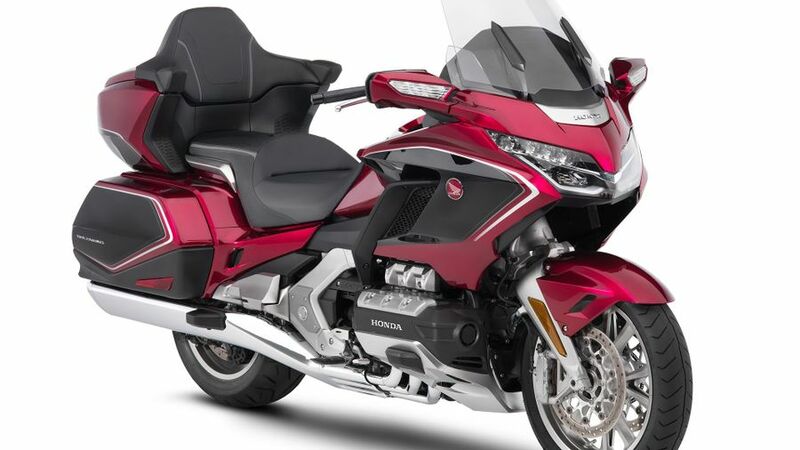 Interested in buying a Honda GL1800 Goldwing? 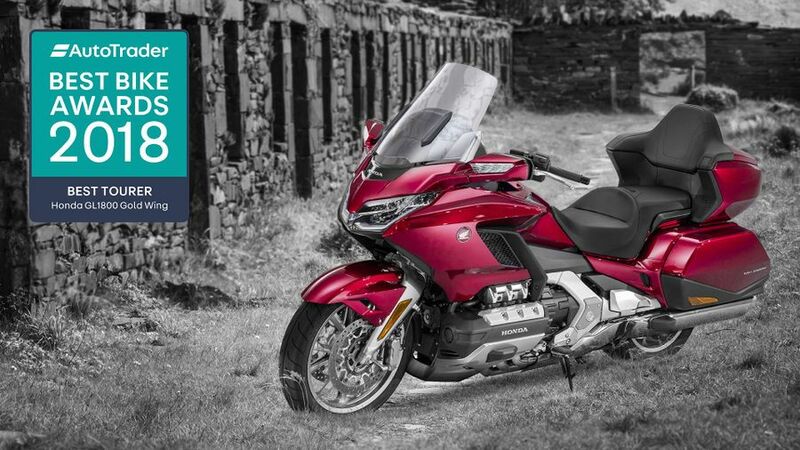 Full-dress tourers may not be every biker's cup of tea but you can't fail but to be impressed by the all-new 'Wing. The amount of design and engineering effort - not to mention innovation - that must have gone into it is simply mind-boggling: an all-new flat six that's both more powerful and lighter than the old and comes with Honda's optional (and very clever) DCT semi-automatic gearbox; a pioneering wishbone front end; electronic rider modes and a compreh3ensive entertainment system; satnav and heated seats as standard, the list goes on. But best of all is how integrated and refined it all is and how well it works. This is a quantum leap up from the old 'Wing. The proverbial 'Armchair and slippers', redefined. Yes, the 'Wing's all about comfort and it is truly sumptuous and aided by a now electronically adjustable screen and standard heated seats, but this new 'Wing, in also being lighter and more compact than before, is also more manageable, as well. Of course it's still a handful - all big full-dressers are - but the electric reverse helps and it's certainly an improvement over the old. Pillions will simply love it. Odd one this. A Gold Wing? Practical? Yes, if comfortable touring carrying everything including the kitchen sink is you be-all and end-all. But it's size, bulk and extravagance means its never a serious commuter, traffic-splitter or workhorse, that'd be like using a Bentley as a tradesman's van. All that said, this new 'Wing is also, despite initial impressions, far more manageable than you might expect and also better at showing a fair lick of speed down dome winding country roads, too. Fun can be had. And for those that love them, a 'Wing really can do it all and they'd settle for nothing else. Forget those preconceptions about a lumbering barge or suchlike. Ever since the 1500 'Wing, Honda's flagship has had enough speed and handling to embarrass unbelievers; the bar was raised with the faster, lighter GL1800 in 2001 and now this all-new version, with 125bhp and enough creamy urge to tow an artic yet also a lighter chassis and uprated, tauter suspension, redefines what a 'Wing is capable of. Sure, it's not really built for it, but there's a huge pleasure in 'making good progress' on the 'Wing. It's big, linked, six-piston stoppers are hugely impressive and big step up as well. Simply, the new 'Wing redefines 'Smooth'. While the big six glides you along on a creamy wave of uninterrupted torque, its uprated chassis delivers simply a magic carpet ride of comfort. Simply, on motorways or long uninterrupted hauls, the new 'Wing is as slick, refined and sumptuous as motorcycles get. Better still, the new electronically adjustable suspension, which adjusts according to riding mode, means that the newcomer is also far more reassuring, engaging and fun through a reasonable set of twisties, as well. In 'Sport' mode there's less wallow and weave while even in Touring it's an improvement over the old which all adds to the fun. In all honesty, what with the 'Wing still being brand new as this is written and also being a completely new machine, it's far too early to proclaim with any certainty here. 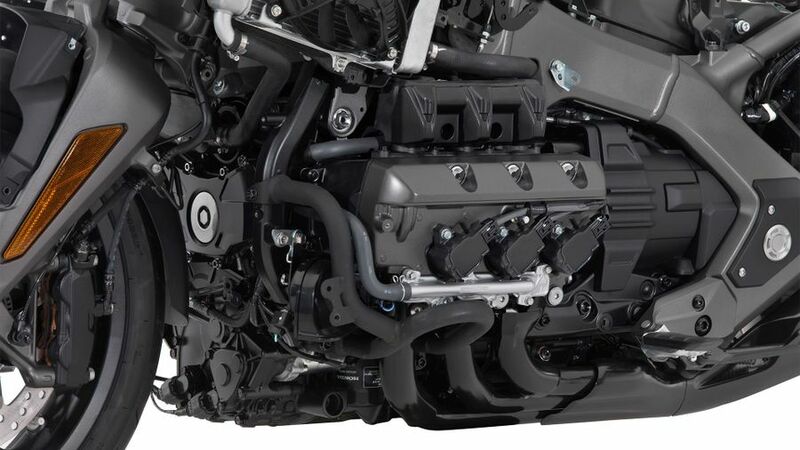 That said, Honda have stuck with an engine layout that has been refined constantly for over 40 years, its DCT is now fairly refined and we fully expect Honda to have pulled out all the stops with what is, after all, their flagship machine, so we have no real concerns. That said, for almost 30 big ones, they damn well should have done, too. Where do we start? It's often been said that Gold Wings comes with everything including the kitchen sink, but with this all-new version it's truer than ever. 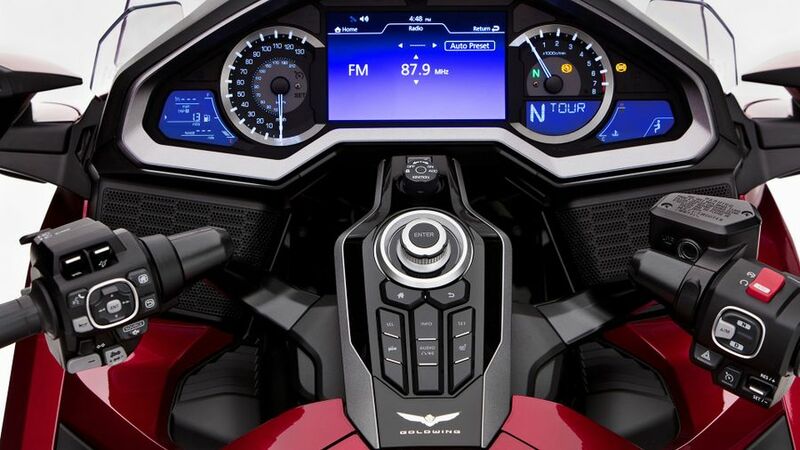 Here's just some of them: electric screen; heated seats; optional DCT, parking brake; reverse gear; built in luggage and audio system; standard satnav and heated grips; cruise control; full-colour TFT instrumentation; keyless ignition; specially damped luggage compartment lids; central locking; rider modes the list goes on… Maybe it is worth that £30K price after all? There's no getting away from the fact that the 'full-dresser' market is a very niche, slightly oddball one, something removed from mainstream motorcycling. 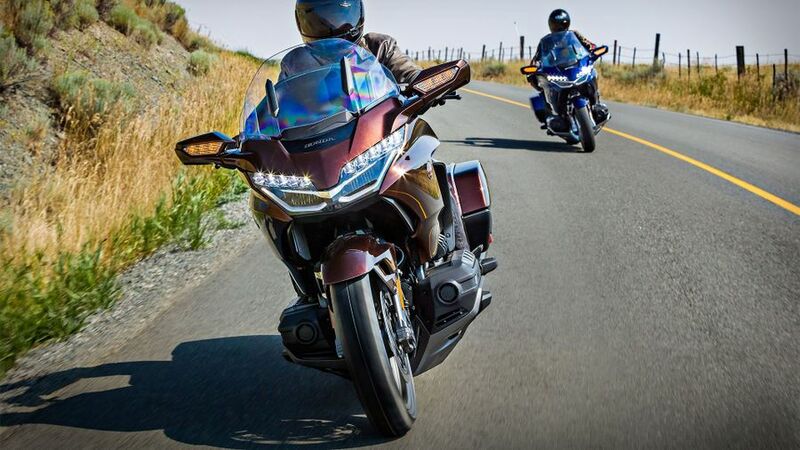 So much so that there really, are only three or four bikes which qualify, the others being BMW's equally six-cylinder K1600GT, Harley's perennial Electra Glide and Indian's Roadmaster. But as those bikes suggest, in America at least, the land of the Winnebago, it's also a very important and popular one. There, in particular, 'Wings have a massive following and going by the abilities and spec of this latest model, this new one will prove just as successful. If you're in Bolton or Bridgewater, though, although fun and impressive, bikes like these make less sense.